Washington D.C. is a fast moving place, and for those in the very top echelons of power, both time and security trump cost efficiency when it comes to transportation. The Department Of Defense has trio of helicopter squadrons ready to fly these VIPs around the region, and to safety should something catastrophic ever occur. When making trips within a couple hundred miles of Washington, high ups such as the Secretary of Defense, Joint Chiefs Of Staff, the Pentagon’s civilian leadership and others will often use one of the military’s little known flying limousine fleets, the VIP converted VH-60 Black Hawks of the Army’s 12th Aviation Battalion’s Executive Flight Detachment. Located at Fort Belvoir, Virginia, about 12 miles from the Pentagon, the 12th Aviation Battalion is the prime provider of airlift support for the Military District of Washington (MDW) and Joint Forces Headquarters-National Capital Region (JFHQ-NCR). It is also part of the Army Air Operation Group and the Army Priority Air Transport Command which move military executives around the world via a stunning array of aircraft. Although the unit also flies UH-72A Lakotas and conventional UH-60 Black Hawks, their VIP fleet, known as “Gold Tops,” are some of the most luxurious helicopters under the command of the Department of Defense, even rivaling the president’s fleet of VH-60N and VH-3D “White Tops” flown my Marine Helicopter Squadron HMX-1. The 12th Aviation Battalion also flies other government officials, agency heads and high-up DoD bosses, and even key lawmakers and visiting dignitaries under certain conditions. As such, scheduling can be challenging to say the least. Secretary of Defense Gates can be seen riding in one of the newer interiors flown by the 12th Aviation Battalion’s VH-60s, which is installed by Sabreliner Aviation, who also provides VIP modifications for Black Hawks for foreign heads of state and royal families from around the globe. Whizzing around Washington’s elite rulers is not the only mission of the 12th Aviation Battalion. They also provide air traffic control and facility support for landing pads around Washington, including the Pentagon, and they can still do many of the missions a standard UH-60 Army unit can. Yet the Battalion’s most interesting and darker secondary mission is evacuating key decision makers and defense officials from Washington in a serious rush in the event of a national emergency, either man made or by nature. One of the older interiors flown aboard the 12th Aviation Battalion’s VH-60s, some of which are being retired and sent to museums after 30 years of work and replaced by newer VH-60Ms. If such an incident were to happen, the majority of the 26 helicopters in the 12th’s inventory would descend down onto Washington D.C. to pick up the highest ranking law makers and federal employees as part of America’s Continuity of Government plan. From there, they will be whisked away to secure underground sites like Mount Weather, Raven Rock and Camp David to provide command and control and oversee the survival, and even the possible rebuilding of the US Government under the most dire of circumstances. This is an outcome that the 12th Aviation Battalion trains for and occasionally exercises in grand scale in front of all of Washington D.C.’s populace. Just last year, the unit put all their helicopters in the air at one time and flew a route through Washington’s highly monitored air space as if such a disaster had occurred. The 12th’s aircraft are equipped for night vision operations, have specialized avionics for their unique mission set, and have both military tactical radios as well as civilian radios used by first responders. The UH-72 Lakotas in particular have Blue Force Trackers which provide locations of other assets in real time as well as providing connectivity to command and control units. The VH-60s have an upgraded GPS/INS navigation suite and weather radar along with enhanced communications capabilities. While Alpha Company within the 12th Aviation Battalion is primarily tasked with VIP airlift, and Bravo Company flies the UH-72 Lakotas, Charlie Company is assigned the task of transporting the 911th Technical Rescue Engineering Company, which is a premier urban search and rescue and disaster response unit. If there were a building collapse or an attack like 9/11 on the Pentagon, this elite unit’s Initial Response Team, supported by Charlie Company helicopters, would rapidly deploy to the scene and begin the task of saving lives at almost all costs. Because the 911th uses specialized vehicles and outsized lifesaving gear, Charlie Company crews constantly train for sling-load operations. During a real disaster, the Company’s nine Black Hawks can make rapid trips too and from their home base, building up a presence at a disaster site regardless of the conditions of the roadways and waterways leading to it. The 12th Aviation Battalion is really kind of the Superman of Army Aviation. Their daily operations may look pretty reserved, and even luxurious in nature, but their ‘other job’ is anything but. The unit is comprised of some of the most experienced Army Aviators, all with combat time, and some of the most dedicated support personnel in the Army round out the unit. If things were to get really bad in Washington D.C., they would be America’s best bet to get our leadership out of harms way as fast as possible so that the country could survive to fight another day. Located at the northeastern tip of Andrews Air Force Base, the 1st Helicopter Squadron provides similar air taxi services as the Army’s 12th Aviation Battalion, although with their nearly antique UH-1N Twin Hueys. The Squadron has a storied past, being the first helicopter unit to ever fly the president officially and has been a fixture at Andrews AFB for half a century. The iconic form of the Huey has been seen thumping its way around Washington for 50 years, and Ronald Reagan regularly flew on HMX-1’s VH-1Ns during his presidency. Even with its age, the UH-1N is still capable. It has a relatively small footprint and can get in and out of tight places. It is also single-pilot certified, even for night-vision operations, meaning that in an emergency, the 1st Helicopter Squadron can launch as many aircraft as pilots available. Still, in comparison to the Black Hawk, which is far from a brand new design itself, the UH-1N is pretty cramped and austere. Some of the 1st Helicopter Squadron’s Hueys are equipped with a basic VIP interior, although it closely conforms to the more stripped down stock Huey models interior, replacing their webbed-canvas seats with plusher cushions and adding more carpeting and sound insulation (click here to see an example and check out the picture below). As such, the 1st Helicopter Squadron’s UH-1Ns offer a somewhat utilitarian point to point service, not one of high luxury. The Huey’s basic interior also allows for rapid re-configurations so that the aircraft can perform different missions if need be, a trait that works well with the flexibility and nimbleness of the Squadron’s unique mission set. The 1st Helicopter Squadron, which is totally unique in the Air Force, carries everyone from key lawmakers to high-up Defense Department civilian and military personnel, as well as visiting heads of state and even Executive Branch workers, but they also have the job of rapidly responding to emergencies around the capital region. This can be a full-on evacuation of high-ranking officials, as they did during 9/11, or this can be to aid in a search and rescue or natural disaster response scenario. With this in mind, the 1st keeps at least two crews on alert at all times, ready to run out to their helicopters to help confront what could be huge unknown challenges ahead. This is precisely what happened back in 1982 when an Air Florida 737 came crashing down onto the 14th Street Bridge in D.C. The 1st Helicopter Squadron, along with their Army and Park Service counterparts, leaped into action, ferrying first responders and divers to the crash scene and assisted U.S. Coast Guard in search and rescue operations. With events like this in the unit’s past, and seeing as there is no other Air Force unit like it (the 459th Airlift Squadron located in Yokota, Japan being the closest thing to it) creativity, adaptability and commitment are all characteristics ingrained in the high-profile unit. The 1st Helicopter Squadron’s geriatric gloss blue and white Hueys have been a constant source of budgetary infighting over the past decade or so as a replacement is said to be badly needed. Along with their Air Force Global Strike Command’s UH-1Ns that provide security and tender duties for America’s ballistic missile sites, the 1st Squadron’s Hueys are not nearly as capable as their modern rotory-wing cousins. 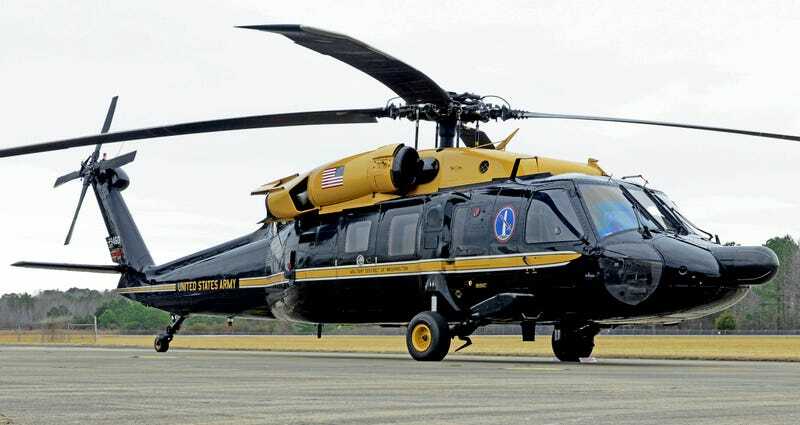 In all, just over 60 of these aircraft remain in service, with less than a third of those serving with the 1st Helicopter Squadron at Andrews AFB, although debate over a replacement aircraft appears to be finally coming to an end. The Air Force now plans to replace these aircraft once and for all with a modern helicopter with enhanced cabin volume, speed and range. At this time, such a replacement looks like it may come to pass over the next decade, with old UH-60A Black Hawks being upgraded and put back into service as UH-60Ls. This would leave only the Black Hawk and CV-22 Osprey in USAF service when it comes to the vertical lift mission. Easily the most recognizable helicopters in the world are the “White Top” VH-3Ds and VH-60Ns that are used exclusively to transport the President Of The United States, their family and his closest advisers. When the president is on-board, these aircraft are famously referred to as Marine One. You can see all the details of what these elite aircraft look like on the inside, and their history, by clicking here. Under such a plan, it is almost certain that Global Strike Command will be getting all their needs fulfilled before the 1st Helicopter Squadron receives any new airframes, so the venerable Huey, with its distinct ‘whomp whomp’ sound, will not be vacating the Washington DC skyline anytime soon. Whereas the 12th Aviation Battalion and the 1st Helicopter Squadron are tasked by the Pentagon to fly around various generals, agency heads and secretaries, HMX-1 is focused on the White House and its air transportation needs. This was not always the case though, as President would fly aboard Army helicopters just a regularly (if not more so) than Marine operated ones up until 1976, when the USMC took over sole responsibility for the White House’s vertical lift mission. Still, HMX-1 has been flying the president, and innovating the mission, since the late 1950s. The “green side” helicopters are also used for HMX-1’s secondary function that stems back to the squadron’s founding, which is test and evaluation and tactics development. New subsystems are put through their paces and new procedures are dreamed up by HMX-1 crews, which are then vetted and deployed to the fleet. As such, the same pilots that fly presidential support missions will also use their skills to build a more effective front-line Marine helicopter force. Currently, HMX-1 has given up all its venerable “Green Top” CH-53s and CH-46s. In their place are a dozen MV-22 Ospreys. The Ospreys cost over $65M apiece but it can self deploy over long distances, which their slower and shorter-ranged conventional helicopter predecessors could not. In this function, the Osprey’s speed and range is nice, but it is a bit of a performance mismatch when flying in the presidential airlift formation, as the president still flies aboard the much slower White Top helicopters used as Marine One. Both White Tops, the VH-3D and VH-60N are finally being replaced by a the Sikorsky S-92 Super Hawk based VH-92. This comes after one of the biggest procurement controversies of the last few decades attempted to fund and procure a EH-101 based, triple engine Marine One replacement helicopter. The program was a cost spiraling disaster (as many predicted) and the Pentagon hopes the more conservative S-92 replacement route will be much more economically viable. S-92 Is The Next Marine One, What About Combat Search & Rescue? The squadron, which has their own shoreline base in Quantico, Virginia, is separated into two ‘sides.’ The “white side” which handles the president’s exclusive “White Top” helicopters, and the “greens side” which handles the “Green Top” helicopters used to transport the White House Press Pool, invited guests, counter-assault teams, Secret Service, local officials and other White House aides during presidential movements. The two fleets are held to different training, security and maintenance standards, with the “White Top” fleet living within its own protective ‘cage’ within HMX-1’s hangar facilities. When it comes to transporting VIPs aside from the president, this happens all the time during White House support missions, with key figures riding along with the President, or in the decoy VH-3D or VH-60N aircraft, or even aboard an accompanying Green Top during transits. Yet the White Top aircraft are not often used for discreet VIP transportation without the president involved as they are an icon of the office and live their lives under tight security and maintenance standards, which makes their operation quite costly. They are also heavily tasked with the president’s travel schedule. That is not specifically to say that they will never be used to move extremely high-power dignitaries alone, although it seems to be a fairly rare occurrence and most likely comes at the orders of the White House Military Office. Some may ask why this incredibly expensive and complex task needs to happen nearly everywhere the president visits, especially considering that there can be multiple stops by Air Force One in a single day. The answer is simple: contingency operations. You can use your own imagination on this, but if the president were under great threat, their motorcade were attacked, or a strike against a certain area where he or she was at were imminent, being able to evacuate them on short notice to a safe site a few hundred miles away is a very attractive option to have. As such, the practice of taking a pair of White Tops nearly everywhere outside of Washington D.C. the president goes has been a popular practice at least since the Obama Administration came into power. The crews and aircraft of HMX-1 certainly have a role in evacuating the president and their cabinet should something terrible occur in Washington D.C. The VH-3D and VH-60N’s elaborate self defense suite, the most capable on any helicopter in the world, which includes directed infrared countermeasures and other jamming equipment, along with their extensive communications suites, makes them the absolute best candidate to pluck the president, their family and their closest staff members out of harm’s way. In order to do so, HMX-1 would not even have to fly up the Potomac 30 miles from their home base to Washington DC, as the squadron keeps a constant presence and forward stages their missions at Naval Support Facility Anacostia right across the Potomac from Reagan International Airport and just 3 miles from the White House. Such a mission would be the highest priority air transport mission of all time if it were to ever occur and it surely is one of HMX-1 and the Secret Service’s biggest and most horrifying contingency plans. In addition to the Squadron’s close proximity to the White House, the unit is seamlessly integrated with Secret Service operations, including the deployment of Counter Assault Teams should the president come under attack or his (or her) helicopter were to go down due to mechanical failure. These teams always travel along in Green Tops when the president is traveling abroad and using vertical lift instead of the presidential motorcade. Within the high-security confines of Washington D.C., this support is really not needed and White Tops will often be seen flying without Green Tops in the formation, although at least two or more identical White Tops will work in unison, with at least one as the decoy chopper, whenever the president flying. Green Top aircraft on the other hand can fly Washington VIPs, although they rarely do so as the Osprey’s large footprint, expensive operating cost and large volume would be overkill for the vast majority of these types of missions. Additionally, between test and development duties and providing the White House with the missions it needs, there is very little time for ‘external’ VIP missions. Almost everywhere the president travels a pair of White Tops goes as well, even if they never fly the president and are never even seen by the media, with the secret service using the presidential motorcade instead. Like the presidential motorcade, the White Tops arrive a few days prior to the president’s visit aboard a heavy USAF transport aircraft. They are then unpacked, assembled and have their engines ran and are checked for issues. Sometimes they are even test flown. Then they are stowed in a hangar out of site. After the president has left on Air Force One, they are dismantled and loaded aboard a heavy transport (C-17 or C-5) again to be flown to another locale ahead of an upcoming presidential visit or they will be flown back to HMX-1’s headquarters in Quantico. Generally, HMX-1 spends the majority of its missions around the Capital Region hauling the president to and from the White House and Andrews AFB, although the helicopters are also used for retreats to Camp David and to visit other military facilities within a couple hundred miles of the White House. Other power players that are cleared to fly have to put in requests and make their case as to why using a helicopter is a better choice than other forms of transportation, as well as what the flight is for in the first place. Only the highest priority of flights pickup and drop off direct. In other cases, passengers will have to make their way to the helicopter unit’s home base before the flight or travel to one of the helicopter landing areas around D.C.’s outskirts to board if they are not of super-high priority. In other words, unless you are at the very top of the Pentagon or Washington D.C. power structure, don’t expect your helicopter to land outside you house or atop your place of work and take you where you want to go. You may have commute a bit by land in order to commute a lot further by air. This may seem a little trivial, but the fact of the matter is that flying through Washington DC via helicopter is a complex and elaborate affair. Special training is required to understand operations in Washington DC’s Metropolitan Air Defense Identification Zone (DC ADIZ) and the Washington DC Metropolitan Area Flight Restricted Zone. Reagan International and its air traffic are a major factor as well and crews have to stay in constant contact with Reagan Tower while transiting the area on pre-planned and highly defined helicopter routes. Then there are a bevy of other law enforcement and agency helicopters working in the area. Thus not having to fly right into the heart of Washington D.C. is a major plus. This also allows for some noise abatement for Washington DC’s citizens as well. Simply put, there is no better executive helicopter transport service in the world than what HMX-1 offers. The attention to detail and mission focus, especially when it comes to White Top operations, is more akin to a space launch than a relatively routine point-to-point transport mission, and the squadron represents the pinnacle of VIP helicopter transport world-wide. In a place where ambition is a life force of its own and hierarchy is as important as it is frustrating for many, using Defense Department assets as your personal aerial taxi service is a priority and importance based proposition. When it comes to HMX-1, who gets to fly aboard Green Tops or White Tops and when is generally a White House Military Desk decision and is based on the Administration’s goals and directions. How it works with the 12th Aviation Battalion and the 1st Helicopter Squadron is a whole other story. Importance and job title, not just rank and seniority, is everything when it comes to competing for VIP helicopter mission slots. The president and the Secretary of Defense sit at the top tiers of priority, with the Chairman of the Joint Chiefs of Staff falling into the next tier. Below them are the heads of various commands and civilian secretaries of the specific services and departments. Generals also have a pecking order and it is not necessarily based on rank alone but their importance at the time the request is made. For instance, if a General that is running a foreign war is in Washington D.C. for a visit they may get a higher priority ranking than a higher ranking General that is requesting airlift support for a fairly mundane event. Keep in mind, that these three squadrons of military helicopters, all heavily focused on executive airlift in the capital region, are augmented by the many Federal Government non-military agencies that have their own fleets of privately registered helicopters. There are 550 of them in fact (as of 2011), and that number is rapidly growing, far outpacing the growth of fixed wing aircraft ownership among Federal Agencies. The Department of State has its own air force, and the Justice Department and the Department Of Homeland Security is not too far behind, but pretty much all other major agencies have their own pocket aircraft fleets as well, many of which include helicopters. As to who would get plucked from impending doom should an evacuation of key officials actually occur, that information remains guarded, although it is pretty apparent that the first priority would be to airlift the National Command Authority principals, along with the president’s cabinet and family, and key military leaders and agency heads, along with their inner circles. There is also the succession issue, with the Speaker Of The House being third in line after the Vice President. As such, these individuals may also have to go to separate locations from where the president is taken to for redundancy’s sake. In the past, members of the Senate and House were also part of the Continuity of Government contingency planning, especially senior members, so if there is extra capacity and time, some of them may be taken as well. Also evacuating at least some of the Supreme Court Justices would be a priority in order to keep some semblance of checks and balances. As you can see, this list is quite large, so the 50 mile or so trip to known secure alternative operating sites would have to be made many times if possible. As such, a priority list is sure to exist beyond just the obvious individuals. Also complicating scheduling are the other commitments that these units have, such as flyover requests for funerals and large events. The 12th Aviation Battalion in particular is on high alert for carrying members of the 3rd Infantry Regiment’s Old Guard as well as a General Officer to Dover AFB where they will meet the arrival of fallen heroes and in some cases their grieving families. This process is called Dignified Transfer of Remains and it is taken very seriously by the unit. As such, there are a lot of competing demands and only so many helicopters to go around. A major operation for the unit is a 24-hour standby mission to carry members of the 3rd Infantry Regiment’s “Old Guard” and a general officer to Dover AFB to meet the arrival of service members who have died while in the service of their country. Although officially known as the “Dignified Transfer of Remains,” it is called “Fallen Heroes” by the members of the 12th Aviation Battalion. Once the transfer of the remains is completed, the 12th returns the Honor Guard to Washington. They do not transport the fallen hero. You can get better idea of how scheduling a flight works by checking out the 12th Aviation Battalions home page here for yourself. Although many of these helicopters have specific missions and are scattered around the US and even the world, the ones that are located near Washington DC can also be used for executive transport as well as their other missions, and some are probably designated solely for the executive airlift mission alone. What this all points to is that U.S. Government funded executive vertical airlift has exploded from a cottage industry mainly dominated by the military to a high-demand product with multiple governmental users. Just like big business executives and billionaires, Federal Government power players see a private jet as a necessary tool, but a helicopter is the ultimate time machine and luxury, taking a VIP and their cadre point to point as fast as humanly possible. Then there is also the prestige of showing up in a helicopter. It may sound petty, but it exists, trust me. It is interesting to note that even though military budgets are under the continued threat of deep cuts, with major and critical weapon systems being retired in the vein of savings, nobody in Washington is complaining about the pocket armada of aerial limousines that zip around the Capital Region right in front of them on a daily basis. Maybe this is because lawmakers and government insiders hope to get a taste of this awesome capability sometime in their own careers if they have not already done so, or maybe it’s the fact that these aircraft have a secondary role of rescuing D.C.’s elite should the something horrific happen. As such, anyone who seeks to cut their existence as a budgetary line item may face political retribution should an emergency ever dictate their use. Or even worse, they may be left regretting their actions if Washington D.C. is smoldering around them while they stand on the Capitol Lawn wondering where’s their ride. Coming Soon! : Part II of this series will unveil the military’s flying fixed-wing limousines that cater to D.C.’s top brass.